The KP SKIPS (crispy corn fries to the uninitiated) FREE COMICS promotion was a big marketing push for IPC's weekly comics during the summer of 1984. Unfortunately, it fell foul of an industrial dispute between the publisher (comics being a small, but lucrative, part of the vast publishing conglomerate) and the National Union of Journalists (NUJ) which saw the publication of titles across the business disrupted. 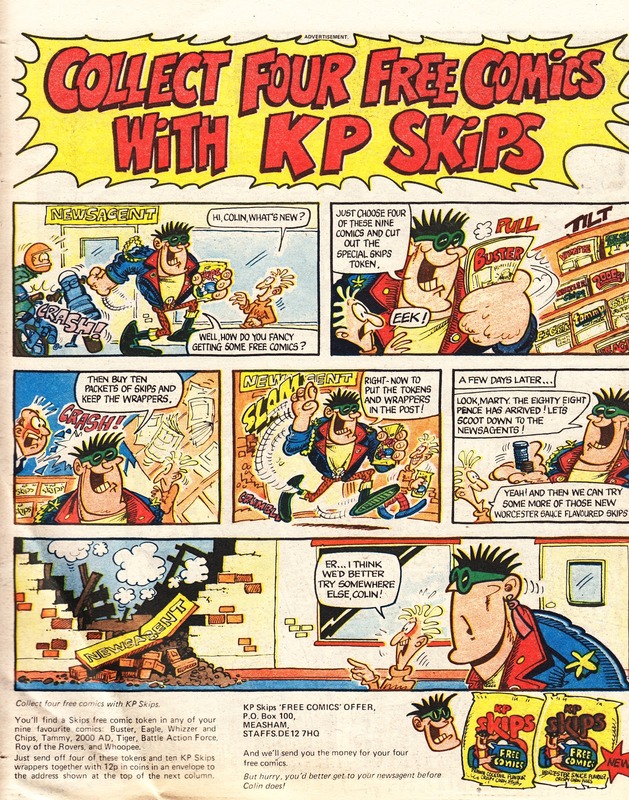 The promotion, which was also featured on packs of the snack, started in June and ran all the way through until September in the titles featured below. Note one obvious omission. The strike disrupted several titles (I can remember finding new issues became more difficult although I don't remember which - with one exception - vanished and for how long. By the end of July, IPC were forced to change the promotional copy running in the weeklies (below). 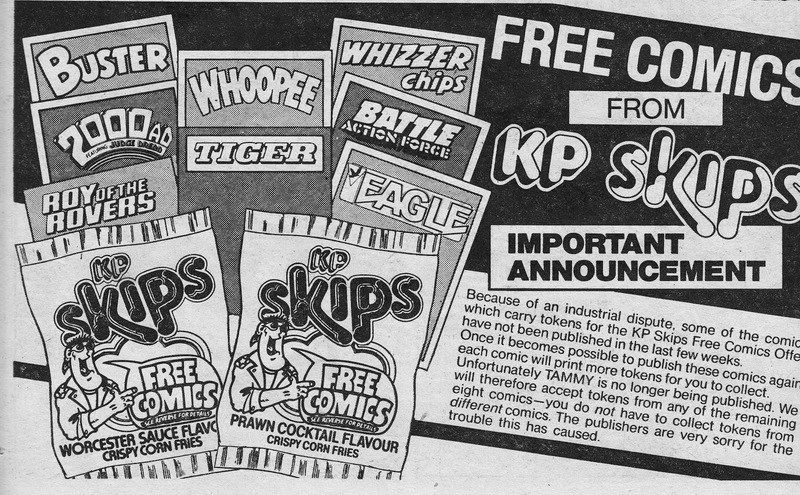 The girls comic TAMMY was one (of two) titles that didn't survive the disruption. Along with SCREAM! which - for whatever reason - was never part of the promotion. It's possible these two weeklies were the most marginal sales-wise and IPC felt readers wouldn't return after the hiatus in sufficient numbers to make them viable. 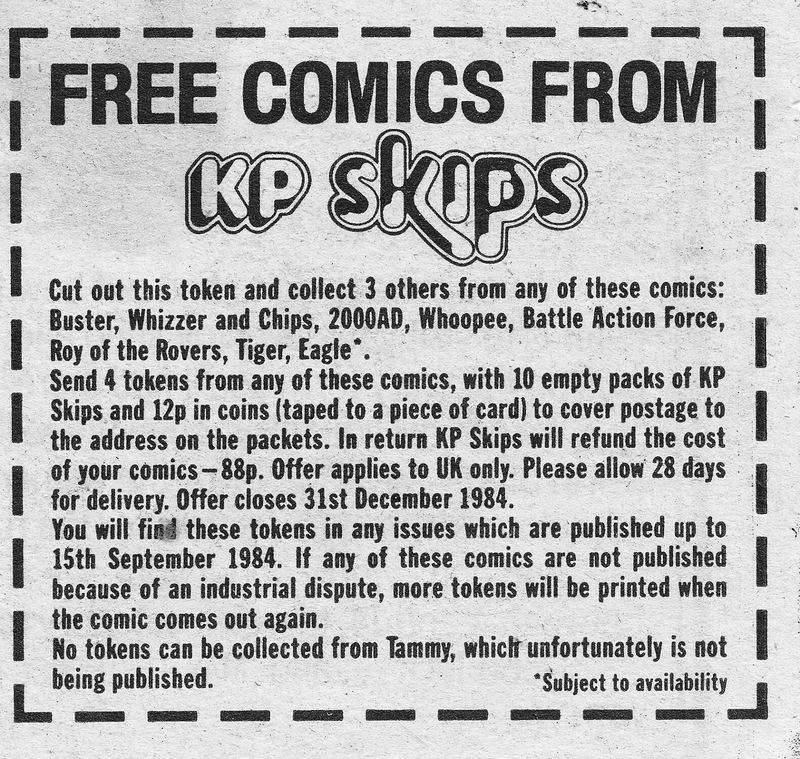 Another option, which I personally think is likely, is that IPC's management wanted to send a clear message to the workforce that industrial action was not without consequences... and sacrificed two comics (one from the boys department, one from the girls) to underline the point. 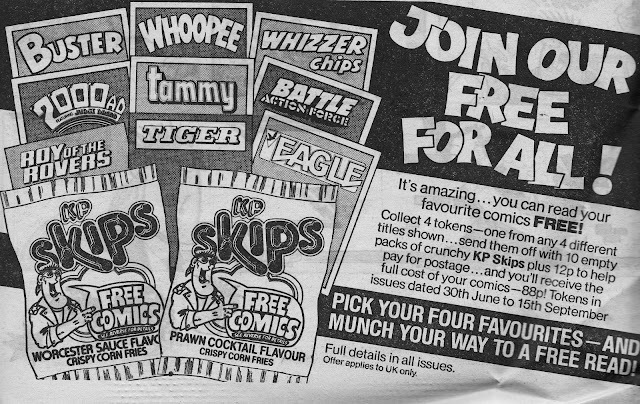 But why wasn't SCREAM one of the free comics? The legendary horror weekly ("not for the nervous!") 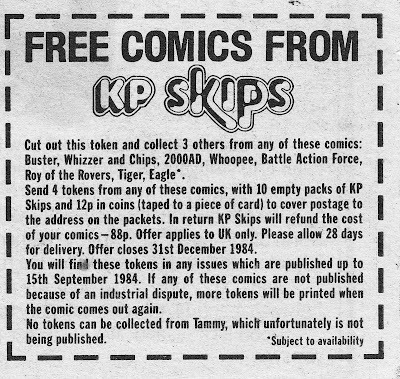 launched in March of '84 so could have been. Maybe the lead times demanded by the promotion meant that its launch wasn't finalised when the campaign had to be ready to roll? 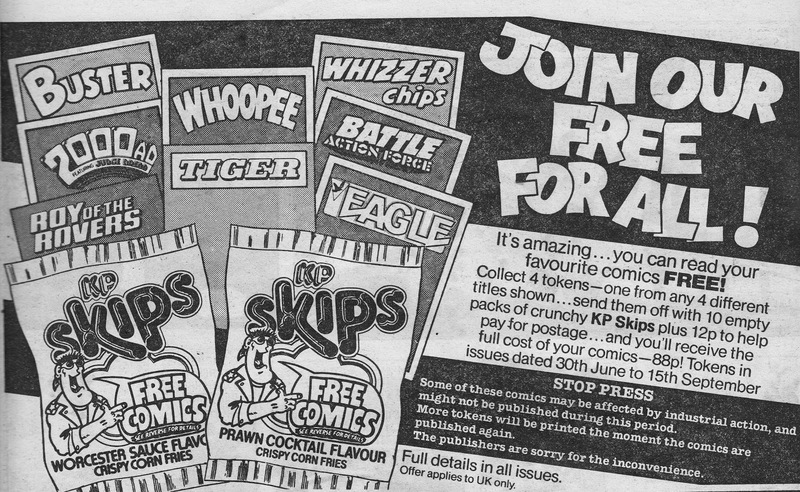 Or, maybe, KP were a little skittish about being associated with a horror comic. If that's the case, maybe that was an early warning shot across IPC's bows that the new comic could be trouble. Or, were the upper echalons already pondering the fate of their latest launch and suspected it wasn't going to survive the duration of the promotion. Did Scream's absence help ensure that it was the sacrificial lamb selected by management?